Three years after the original comes another NexDock, a laptop shell aimed at owners of Android phones or lovers of the diminutive Raspberry Pi (and its brethren). The first NexDock appeared in 2016, with 2,673 backers pouring a stonking £274,639 into the product in the hope of owning something that turned out to resemble a white, slightly plasticky Macbook Air clone. Except, of course, that NexDock dispensed with the guts – the laptop was a mere shell, providing screen, keyboard, trackpad and battery. It was up to the customer to plug in something to run with. The thinking back in 2016 was that this would make an ace Windows Mobile Continuum device – plug in your Lumia and enjoy some big screen Windows 10 action. Alas, things did not pan out quite as expected, leaving the things serving as slightly shonky hosts for Raspberry Pi computers (the Bluetooth connection required for the keyboard and mouse was distinctly flaky) or ending up as a second screen for an Android phone or similar. Backers of the scheme did receive their machines after a few stops and starts (including the factory catching fire and some manufacturing snafus) and, to be fair, the hardware worked pretty much as advertised. This Vulture had one and, at around £90, it wasn't too bad. The screen resolution wasn't great, and after I had performed a hardware modification involving some snippers and a steady hand, the battery would charge. But it met my expectations. However, there was no getting away from the fact that it had been built down to a price, and with the demise of Windows Mobile, the main use for it became a handy host for a Pi. And for that, the Bluetooth connectivity proved a pain. Three years on, and after backing away from the seemingly dead end of Intel's Compute Card platform, a new NexDock has cropped up on Kickstarter (rather than Indiegogo this time) at a higher price point, but also rocking some enhancements. Hardware-wise, the hefty machine weighs in at over 1.4kg. The 13.3" IPS LCD screen won't set the world alight with a 1920x1080 resolution, but will do the job. Audio comes from four 1W speakers, and the battery to drive it all is rated at 38Wh. The case is aluminium, with an edge-to-edge keyboard, and someone has taken a grinder to the epic bezels around the screen of the original. There is also a full-sized USB-C input for those Android phones and an HDMI input for Pi fans. Those Pi aficionados will also be relieved to see additional USB ports into which, according to CEO Emre Kosmaz of Nex Computer assures us, the diminutive computer can be plugged in rather than make do with Bluetooth. Kosmaz expects things to go more smoothly this time around (although to be clear, the company did eventually deliver to its backers). He told us: "The whole thing from start to finish was a new experience for us and learned [sic] the difficulties of dealing with a hardware manufacturing project." While the unit price has gone up, the crowdfunding goal has dropped. This is down to the gang having learned how things work the Shenzhen way. Kosmaz explained: "Over the years, we have established more contacts in Shenzhen and now can bend MOQ [Minimum Order Quantity] levels down to 1,000," rather than the 3,000 needed for the first version. Still burned by the delays caused by the fire at the NexDock 1's manufacturer, Kosmaz also told us: "ODMs work with many different assembly lines (depending on the size of the order) and we will try to choose an assembly line with no fire accident in the past." Looking to the future, the team plans to better integrate USB-C PC sticks, although it could well be running fullscreen mobile phone apps via Huawei's Easy Projection or Samsung's DeX that most users opt for. Coupled with something like Windows Virtual Desktop, the latter presents an intriguing option, particularly for those still yearning for Continuum. In the interests of full disclosure, this hack has dropped the equivalent of around 25 pints of very expensive London beer on the campaign (the NexDock 1, for all its faults, proved a handy thing for on-the-go Pi playtime) and will update should something ship in September. As with all crowdfunded campaigns, we would remind backers that there is no cast-iron guarantee that anything will ever appear. Just ask those who dreamed of mobile ZX Spectrum gaming. 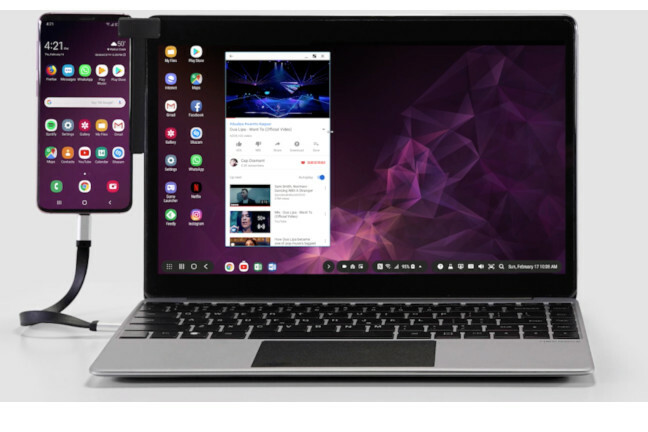 Or the brave souls that backed the Superbook, a $99 device to turn an Android phone into a laptop. The latter had nearly $3m shovelled into it by over 16,000 backers in a 2016 campaign, and now, nearly three years on, some are still waiting for their Android dock (judging by the prodigious amount of wailing on the Kickstarter page).